The material in the universe is composed of photons, matter (including dark matter, baryons, and leptons), and dark energy (the mysterious stuff that is causing the Universe’s expansion to accelerate). One of the simplest models which incorporates all four of these assumptions is the model, where the refers to the cosmological constant (often identified with dark energy), and CDM stands for “Cold Dark Matter” (where “cold” here means that the dark-matter became decoupled from the other components of the Universe when it already slowed to non-relativistic speeds). The model, with various refinements, has done very well in explaining the structure of the Universe, and is often referred to as the standard model of cosmology. Today’s astrobite paper gives a nice discussion of some of the ways that we can test this standard model, and outlines some areas that indicate that could be improved upon. 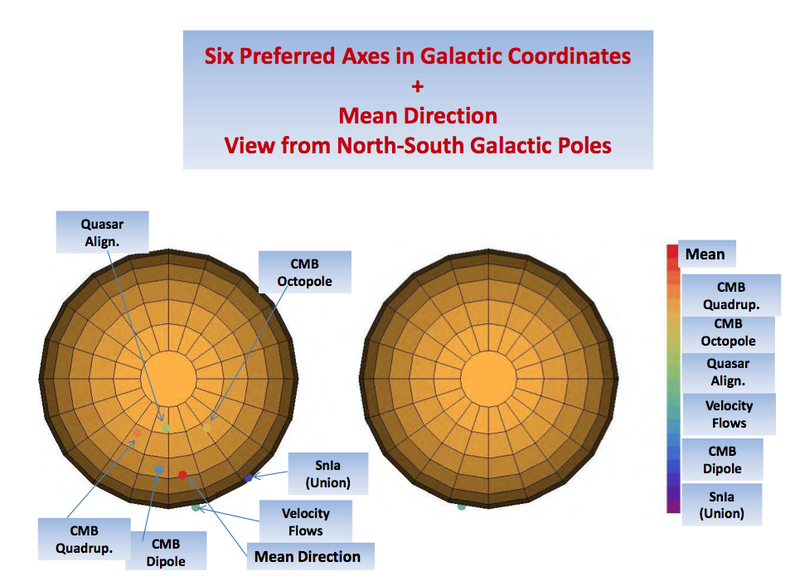 Standard candles and rulers: Type Ia supernovae, Gamma-ray Bursts, HII starburst galaxies, cluster gas mass fraction, etc. On the other hand, dynamic probes tell us about the action of gravity acting on density perturbations to form large-scale structure. Some examples of dynamical probes are: X-rays from galaxy clusters, the Ly- forest (which tells us where hydrogen is distributed by redshift), lensing surveys, etc. As we have mentioned, most of the information these different probes give us agrees well with the standard model of cosmology. Now, what are the areas that has trouble explaining? Various seemingly preferred directions on the sky: Low multipoles of the CMB, alignments in quasar polarization vectors, and a few other observations apparently break the “isotropic” condition of the Universe (see table and figure). Smaller scale issues: the missing satellite problem (which is touched on in the Astrobite galaxy/AGN glossary), the central density profiles of dwarf galaxies, etc. How do cosmologists deal with these shortcomings? How should we approach these issues, considering the fact that has been so successful? From Fig. 1 of paper. The author says: "It is straightforward to show (Antoniou & Perivolaropoulos, 2010) that the probability of such proximity among axes directions that should be independent of each other is less than 1%" Which raises the question: is the Universe truly isotropic? An interesting point that the author raises is that there are different paradigms with which we might approach the standard model of cosmology. Should we assume the validity of then fine-tune its parameters to fit the data? Should we focus on trying to come up with new theoretical arguments explain the few inconsistencies? Or should we try an even more extreme approach and focus our efforts on the small fraction of data that most strongly violates ? The best course is probably a combination of all three, and scientists continue to work from each paradigm. Currently, it seems that one of the most obvious ways to patch up is to impose a slightly preferred direction. There are many conceivable ways for such a direction to crop up; a few examples are large-scale primordial magnetic fields, non-trivial cosmological topologies, an anisotropic dark energy equation of state, etc. (see the paper for a fuller list of proposed mechanisms). In summary, we are living in an exciting time for cosmology. On the one hand, we have in our hands an elegant, simple model which explains the “zeroth-order features” of the Universe very well. But on the other hand, there are still interesting “first-order corrections” and mysteries in (such as the nature of dark energy and dark matter) which reveal that cosmology still has a great deal of rich physics for us to explore and discover. Great article – speaking as a physics undergraduate, really appreciate these articles on astrobites. many thanks!